I've seen posts on two of the cool blogs I follow (Keep Calm And Carry On and Pixie Flute) that there is some new camera buying going on amongst my fellow bloggers. I just got a new Canon PowerShot SX200 and really have no idea what I am doing yet. 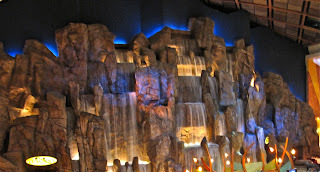 Below are a couple of pictures I took at the Mohegan Sun Casino. I had to use iPhoto to adjust them as they appeared a bit dark and not quite as sharp as I like. I see such great photos on the blogs that I visit. I'm wondering - do most people use their photos as is, out of the camera, or do the majority of photos need to be adjusted in some way with software? Sometimes I feel like I am 'cheating' a bit when I enhance photos before posting them. I'm curious as to what other's out there do and think. Your photos look great CJ. I know absolutely nothing about photography even though it is a passion of mine.... one that I don't follow since i can never get my pictures right. And I feel even less adequate after looking at all the photos on here. I would say that just about EVERYONE uses some form of software on their pictures. I honestly believe that nothing comes straight from a camara anymore. I have an ok camera (Kodak Easy Shore C643) it's pretty much point and shoot. I have used shots straight from the camera but I've adjusted some too. Shots taken outdoors seem to "come out right, the first time" more often than those taken indoors. But, I tend to post those taken indoors more often. So far. Your fotos are great, CJ. Really the only consideration for the camera you have is making the adjustment if you're shooting in Mercury vapor lighting or Halogen. But your software program is sufficient to make those adjustments. Good job! Before digital cameras were invented photographers made adjustments while processing prints in the darkroom using their artistic and technical skills to get the image just right. It's not cheating to make adjustments using software. Some digital cameras cannot capture certain colors very well. I always have to adjust my reds to make them less saturated. Interior shots... most always have lighting that is too dim and yellow. The "not as sharp" part is because the lens has to stay open long enough to let enough light in to take the shot... a tripod would help. But in a pinch... rest your arms on a wall, fence, table or chair; take a deep breath; and take the shot... using yourself as a human tripod. - OR - set the camera down and use the self timer. - If people are moving within the frame they will blur a bit, but the background will be sharper. The image is the message, not the process. oh - forgot to say... Did you have a Cosmo up in the sky bar? That's my first stop when I go to the Sun. 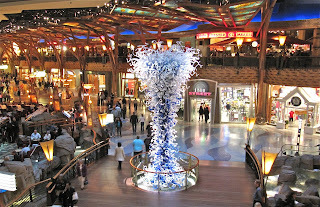 Love that glass sculpture of towering spirals. I tweak about half of my photos. Just keep taking photos that's how you get good at it - keep doing it. I mess with nearly all of my photo's. I don't think it's cheating, if it were, why would people spend the money on Photoshop that they do? Seriously, they are wonderful photo's, looking forward to lots more to come! most of my photos aren't great -- the best ones are ones i've enhanced. the worst ones (and this is most) come from my blackberry or R's iphone both of which are handier than the camera. and i don't think it's cheating. I'm with you CJ. I can't help but feel that I am cheating when I "enhance" a photo. I don't mind cropping, resizing, or removing a rogue item from the picture but when someone takes a crappy photo and makes it look great with software then I definitely feel a bit cheated when I know that. IMHO that should be called graphic art and not photography. To me, photography is the art of taking great photos. As a general rule I don't enhance my photos. I know most folks do nowadays but I always want to shre what I saw that made the pic worth taking. hmm... (I'm back) I was taught to edit/capture the composition of the shot through the viewfinder of the camera. I do feel cropping and/or removing an object is NOT merely "enhancing"... it is altering the original image. But, is that wrong? Dunno. A crappy shot is a crappy shot, period. Simply slapping a filter on a photo takes no talent. Photo retouching is an art in itself, requiring great technical skill. My previous comment referred to using adjustments in photoshop, like... as a photographer would burn, dodge or adjust the exposure while printing in a darkroom. Sorry CJ, this 3 day work week has given me too much spare time. good question...i think iphoto is fine, but should be disclosed when posting! I'm a total point and click person with photography. I know about the rule of thirds and perspective, and sometimes adjust brightness and contrast, but that's about it. I just need a basic point and shoot, autofocus.